Anger Management A-Z :: Unstuck Living Pro! By Sheila K. Bonnett, M.S.W. and Terry D. Crotinger, M.C. Have PTSD clients who are stuck on anger? Problems with domestic violence? Referred by the court for anger management? Looking for a way to provide interactive homework between sessions? This workbook is for you. It not only teaches new tools for anger control, but is meant to increase insight, happiness and peace. 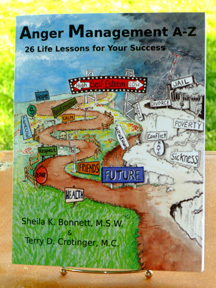 Anger Management A-Z is a building tool that can be applied to teens and adults, both individually and in groups. this workbook is the one for them. What Is The Basis for Your Anger?